To test the effect of petroleum hydrocarbons on predation by the seastar Evasterias troschelii (Stimpson, 1862) on the mussel Mytilus edulis (L.), we exposed the predator with the prey to six concentrations of the water-soluble fraction (WSF) of Cook Inlet crude oil. Seastars and mussels were collected at Auke Bay, Alaska, in November 1980. During a 28 d exposure in a flow-through system, seastars were more sensitive to the WSF than mussels: the LC50 for the seastars was 0.82 ppm at Day 19 and, although no mussels were exposed to WSF for more than 12 d, none died. Daily feeding rates (whether in terms of number of mussels seastar-1 d-1 or dry weight of mussels seastar-1 d-1) were significantly reduced at all concentrations above 0.12 ppm. 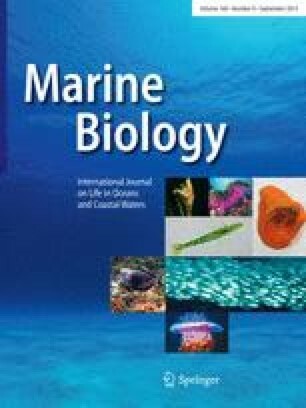 At 0.20, 0.28 and 0.72 ppm WSF, daily feeding rates (in terms of dry weight of mussels) were, respectively, 53, 37, and 5% of the control rate; at the two highest concentrations (0.97 and 1.31 ppm WSF), the seastars did not feed. Seastars at concentrations greater than 0.12 ppm WSF grew slower than individuals from the control group and the 0.12 ppm-treatment group combined. These laboratory results show that E. troschelii is more sensitive to chronic low levels of the WSF of crude oil. The possibility that such oil pollution could reduce predation and permit M. edulis to monopolize the low intertidal zone of southern Alaska remains to be studied.